Why would anyone want to mess with the stumps of a house or bother raising it? Apparently, many structures along the coast often experience damage from the elements such as high winds, sand storms, sea surges, etc. Those already resting on stumps will see damage manifest itself in the sagging floors, misaligned door jambs and window sills, cracks in the walls and floors, etc. These are all signs of a house settling and its foundation being put at risk, hence the need for house restumping. 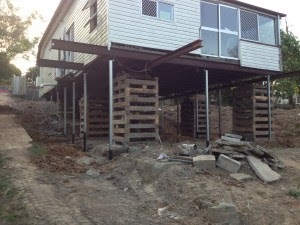 Of course, raising a house or restumping does not only apply to coastal homes; even inland homes may suffer from damaged stumps due to rotted timber or settled ones due to moisture and soil movement. Whether a house is close to the sea or not, it could very well be a candidate for house raising if its stumps need to be replaced. Restumping could actually bring in some positive changes for a property. For starters, it provides a much stronger foundation for the house, thereby increasing its value. Owners may also opt to raise their homes to a much higher level and, consequently, gain an erstwhile unavailable view. Of course, council approval is necessary for such a noticeable change, but some may also choose to raise it high enough to be able to furnish additional living space or to altogether change the look of the house. Obviously, the job of raising and restumping a house requires skill and experience. As a matter of fact, it’s a major enough undertaking that it calls for expertise and accreditation. This is not a project for home improvement amateurs or DIY enthusiasts. If you need your house to be restumped and raised, you want to be assured of a professional service. You want a team that knows how to accomplish the job not only with technical know-how and familiarity with the process, but with respect for your family and your possessions as well. You can expect not only for your property to remain safe and secure, but also to have minimal disruption in your life while the work is ongoing. Choosing the right restumping specialists to work on your home would mean that your satisfaction will be pretty much guaranteed with the employment of high quality materials and professional workmanship. Ultimately, you can count on everything from the stumps to the rest of your property to be left in tiptop condition at the end of the job. Kenneth Lawrence is an “all-around, DIY” handyman. He has been sharing his knowledge and skills about home and structural improvements through his blogs. He had some help with this article from: http://www.qldhouserestumping.com.au/our-services/raising-sliding/.